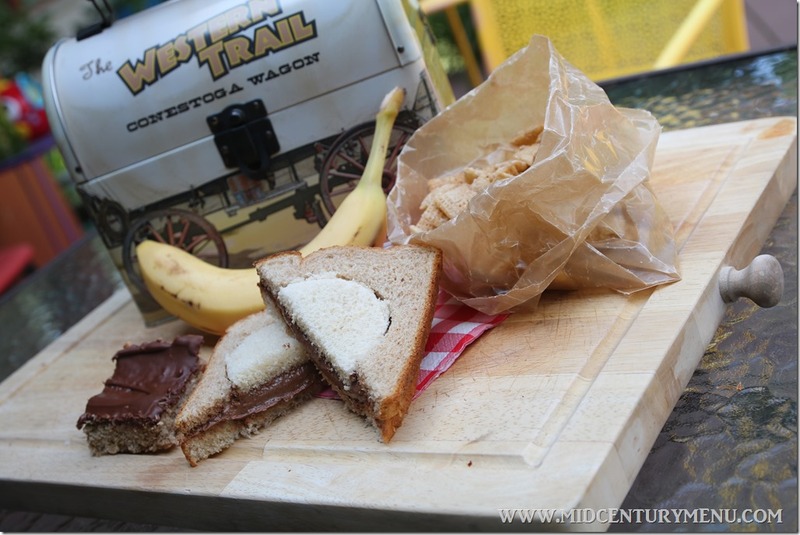 Ever just want to have a chocolate sandwich for lunch? Well, this week we have you covered. 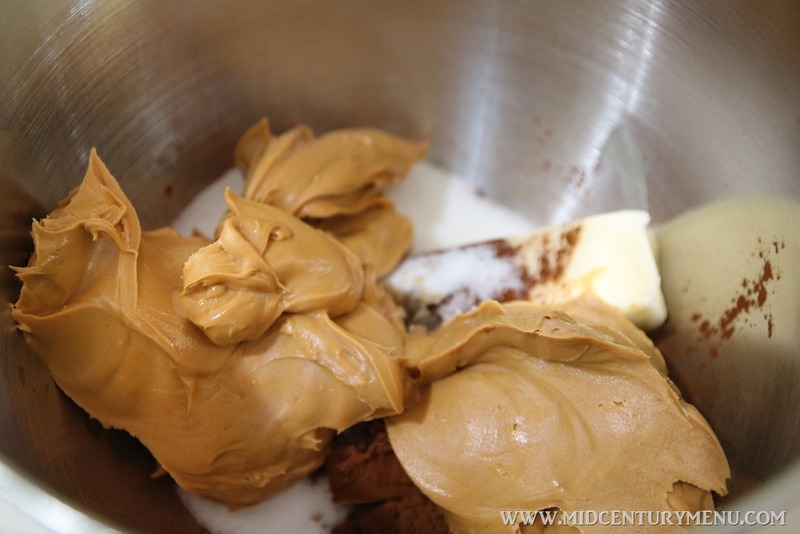 Melt butter, add cocoa, sugar, salt, peanut butter and vanilla. Beat until smooth. Make sandwiches using butter on one slice of bread and chocolate filling on the other. Now, this one isn’t mid-century. 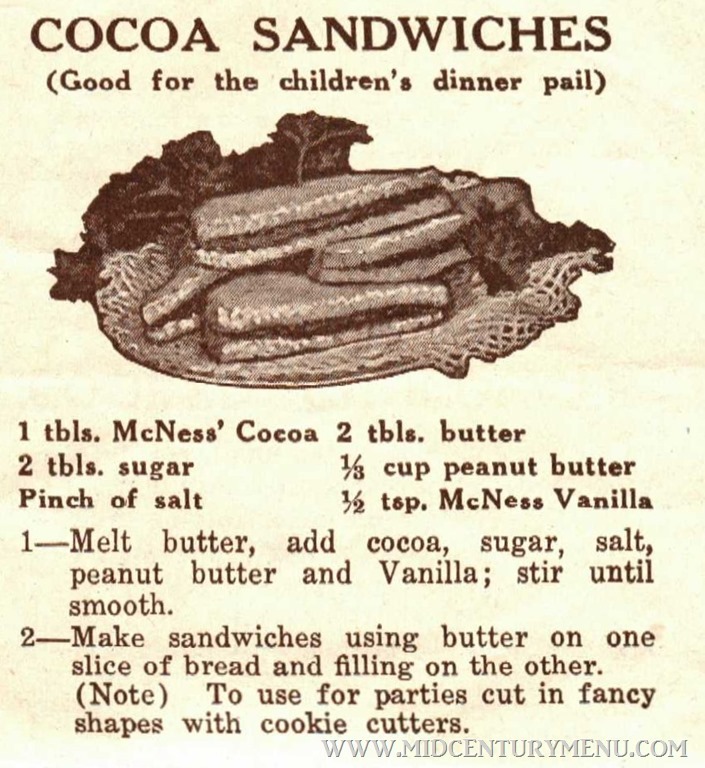 This recipe is from a cocoa pamphlet from McNess from about 1925. But seriously, I just could not pass this by. I had to test it. And, if you are a cookbook collector, you must, must look for a McNess cookbook or pamphlet. They always have spectacular graphics and some interesting recipes. Some are a bit hard to reproduce because McNess sold flavorings and spices, and had some custom blends (like Wonder Flavor). Good news is that McNess is still in business, so you can get their spices and flavorings, even Wonder Flavor in their online store. Anyway, on to the sandwich! 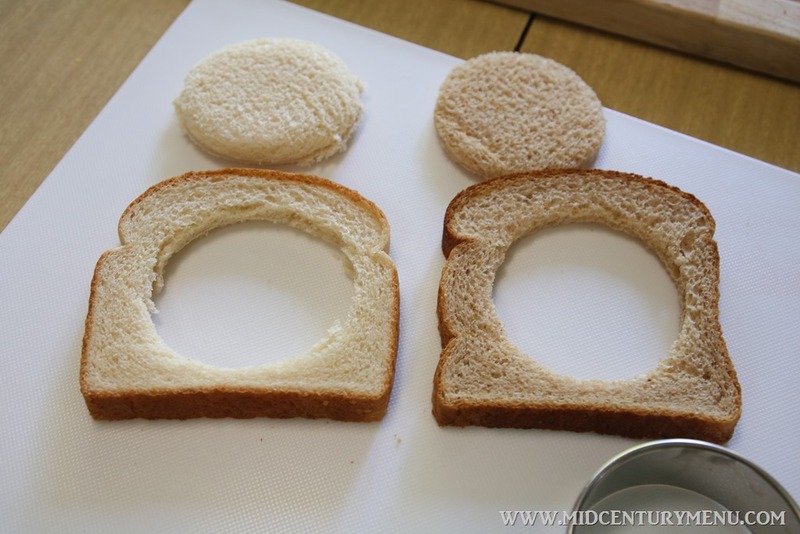 A bonus for this recipe: I saw a sandwich in the Good Housekeeping Book of Breads & Sandwiches that had one slice of white bread and one slice of wheat with shapes cut out of them and then switched. I thought that would be a good, quick way to jazz up a plain sandwich. They used a star cutter, but I thought that would be a bit too futzy so I picked a big, simple circle. We had friends over, so I scaled this recipe up to make 6 sandwiches. And can you see my mistake? I forgot to melt the butter!!!! See? The switched bread cutouts? Totally cute. This ended up being good, but not nearly as sweet as we thought they would be. Since I screwed up and didn’t melt the butter, or cream this properly, they were also crunchy from the unblended sugar. But they were still delicious. 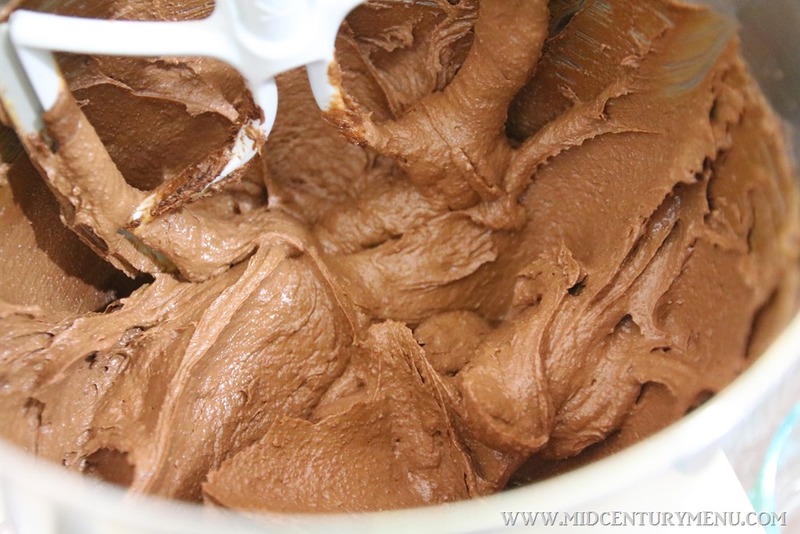 The amount of cocoa really tempers the sweetness and makes it almost on the savory side, with only a slight sweetness and a good chocolate and peanut butter flavor. These are reallly nutty tasting. If you like dark chocolate, then maybe this would be for you. Also, you barely even notice the butter on the other side of the bread, so I wouldn’t bother with that. 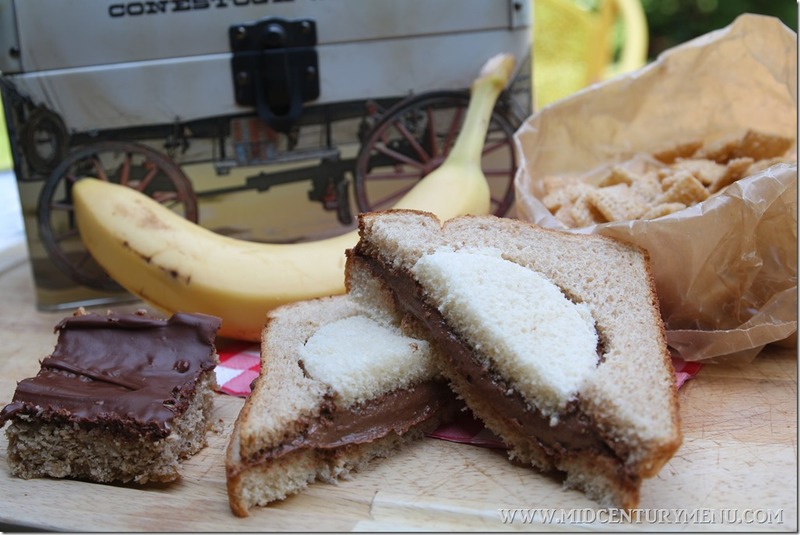 I don’t know if I would scarf this stuff down as a sandwich again, but Carolyn took the rest home and reported back that eventually the sugar incorporated (it took about a day) AND this stuff was amazing on graham crackers. I could totally see that, since a slightly sweeter bread/cookie would have been a much better pairing. 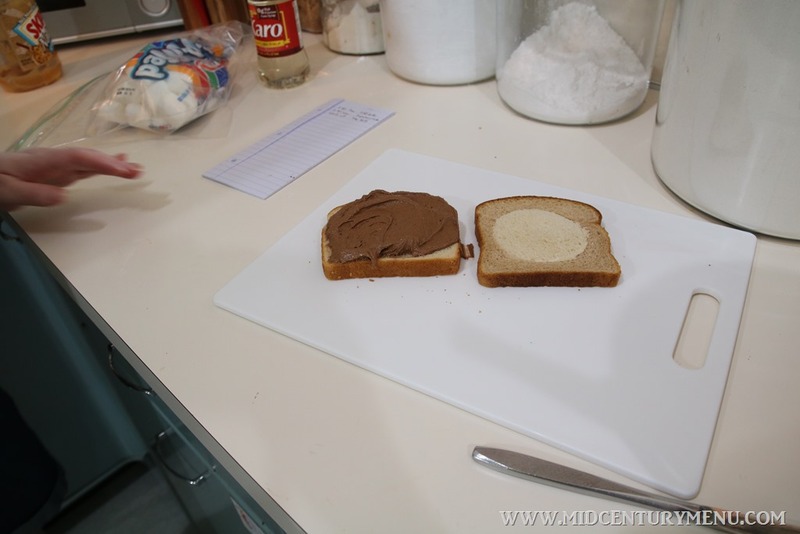 So, if you are looking for a way to make graham crackers or a cinnamon bagel more delicious, have I got a spread for you! I collect vintage cookbooks as well and in so many of the sandwich recipes, savory or sweet, they say butter the bread, so maybe that was just the go to sandwich spread? If my Grandmother ever thought we needed a little treat she made us a butter/sugar flopped which is just a slice of bread smeared with butter and sprinkled with sugar then folded in half. My grandma did the same but she called it a “bubble head sandwich” 🙂 probably because it had no nutritional value. My great aunt used to butter both slices of our peanut butter and jelly sandwiches. 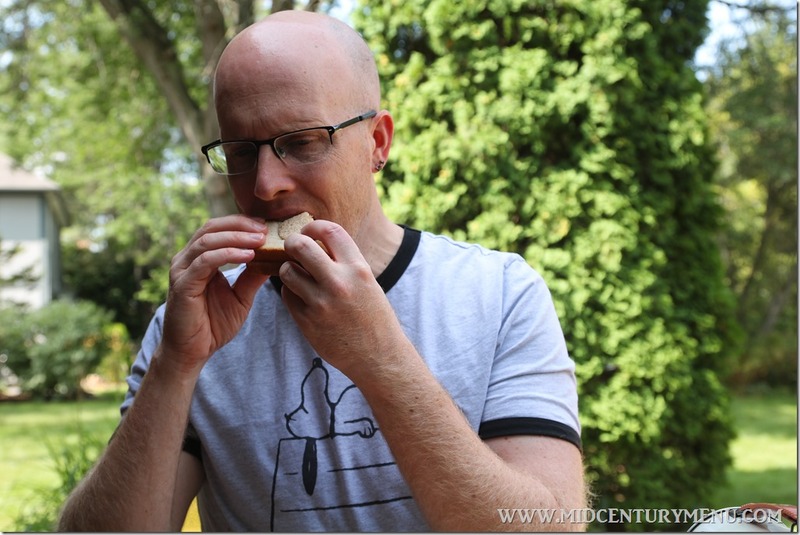 I used to dread that because I wasn’t a big fan of butter on bread back then, and especially not on my pb&j! She was such a sweet lady, I didn’t feel like I could tell her I didn’t like what she made us. Homemade or bakery-made bread was quite a bit drier than what we generally get at the grocery store now. Buttering it kept it from sucking all the fats and moisture out of the fillings, leaving soggy, mushy bread surrounding a stiff plank of–whatever. I remember getting those sandwiches in my lunch as a child because I didn’t like the butter–it was margeringe actually. 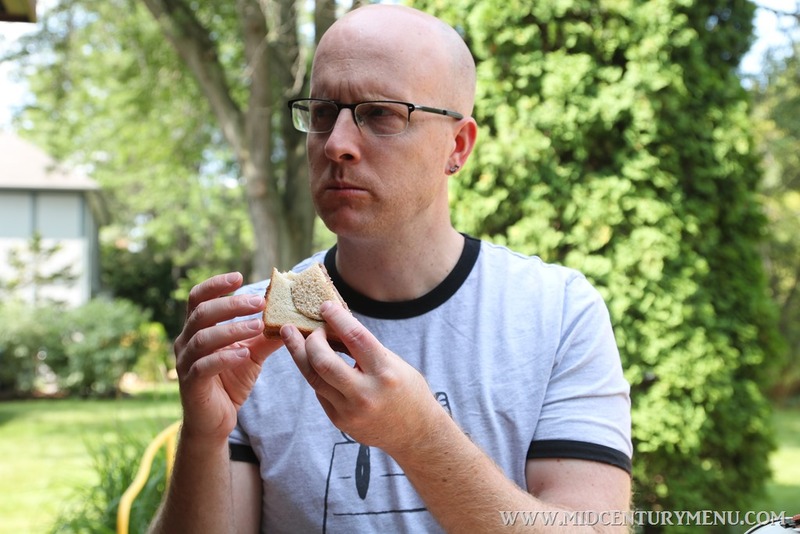 So the choice was a to tolerate a thick schmeer of greasy oleo on each slice of bread on an otherwise good sandwich, or to tolerate a bad sandwich. Now I need to bake some cookies and use this as a spread in between! Maybe a chocolate cookie or plain sugar. Those look pretty darn good! Are you supposed to put the circles back into the crusts? If they were just little round tea sandwich shapes, those would be adorable for a tea party kind of thing. This would be good on banana bread. I love the way you think! Now that I’ve gone vegan Nutella invades my dreams but not my sandwiches…but this could easily be veganized and it looks great, plus, YES, on banana bread. Or zucchini bread, even.